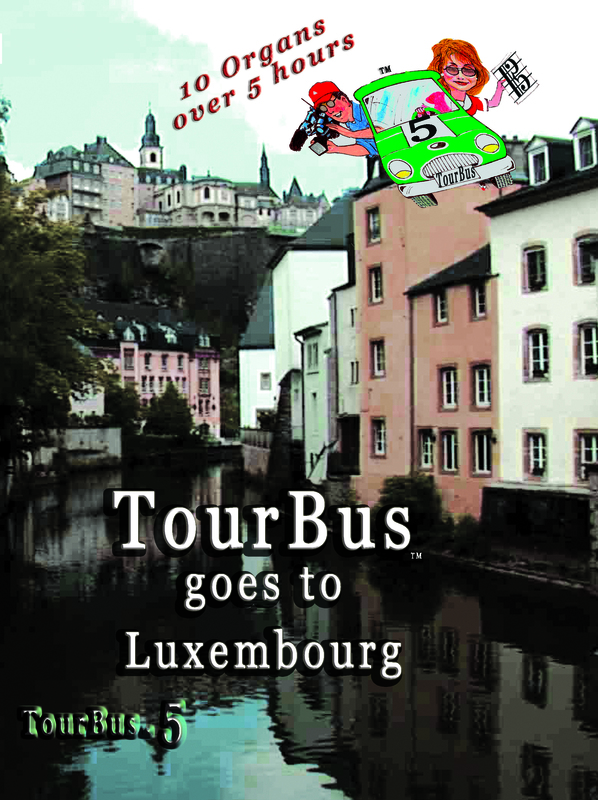 The 5th in our collection where we spend 5 hours visiting 10 great organs in the Luxembourg region, its music, people and places. and the “Offertory on the Grands Jeux” by Couperin. that great organ and performs an improvisation for us. -- Paul Kayser demonstrates and improvises on the organs at the Echternach Abbey and at St. Alphonse Church in Luxembourg City. -- Alain Wirth of the Luxembourg Conservatoire introduces us to the last piano played by Franz Liszt and Carol performs “Andante” by Lefebure-Wely on the Luxembourg Conservatoire organ. -- Mathilda Bargibant gives us a play on the Echternach Abbey Carillon. -- Josée Tani and Carol at the Luxembourg farmers’ market. -- Serge Tani shows us and demonstrates his home organ. -- Carol performs “Fantasia in C minor” by Bach on Serge Tani’s home organ. -- Carol performs at St. Martin’s Church in Dudelange Luxembourg: “Toccata” by Leblanc and “The Hebrew Chorus, Nabucco” by Guisepe Verdi. -- Interviews with Jacques Dondelinger, President and Pierre Nimax Jr., Artistic Director of the Dudelange Organ Society, Luxembourg. 1. The Good Shepherd (by Benoit) (Performed by Paul Breisch at the Luxembourg Cathedral organ). 2. Offertory on the Grands Jeux (by Couperin) (Performed by Paul Breisch at the Luxembourg Cathedral organ). 3. Improvisation (Composed & Performed by Maurice Clement at the Luxembourg Philharmonie organ). 4. Improvisation (Composed & Performed by Paul Kayser at the St. Alphonse Church organ, Luxembourg). 5. Improvisation (Composed & Performed by Paul Kayser at the Echternach Abbey, Luxembourg City). 6. Andante (by Lefebure-Wely) (Performed by Carol Williams at the Luxembourg Conservatoire organ). 7. Fantasia in C minor (by Bach) (Performed by Carol Williams at Serge Tani's home organ). 8. Improvisation (Composed & Performed by Bernhard Leonardy at the Basilica of St. John in Saarbrucken, Germany). 9. Improvisation on God Save The Queen (Composed & Performed by Bernhard Leonardy at the former Buckingham Palace organ now at the Chapel of the Knights, Saarbrucken, Germany). 10. Toccata (by Leblanc) (Performed by Carol Williams) at St. Martin's Church in Dudelange, Luxembourg. 11. Toccata (by Klieve) (Performed by Carol Williams at St. Martin's Church in Dudelange, Luxembourg, with video of the Luxembourg American Cemetery and Memorial). 12. Adagio, Concerto de Aranjuez (by Rodrigo) (Performed by Carol Williams at St. Martin's Church in Dudelange, Luxembourg, with video of the German Soldiers' Cemetery at "Sandweiler"). 13. The Hebrew Chorus from "Nabucco" (by Verdi) (Performed by Carol Williams at St. Martin's Church in Dudelange, Luxembourg, with video of the church as well as aerial views of some Luxembourg Castles).